CRIME, GUNS, AND VIDEOTAPE: Living In A Socialist Country? Wear The Right T-Shirt! Living In A Socialist Country? Wear The Right T-Shirt! 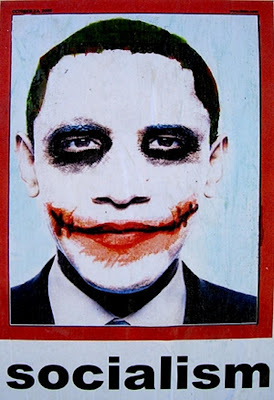 Los Angeles, CA—The latest rage or in some cases outrage is the artistic rendering of the Chairman, Barack Obama. Be the first Obamanomics protester on your block to pay proper homage to this total Bolshevik that occupies our Whitehouse. Fight tyranny! Love it Paul.............. I want at least 4. Paul Obamas admin is asking anyone to snitch on their neighbors that oppose Obama. Even to forward any negative emails to the white house. Amazing. Its tantamount to the PI ASSoc called CALI. Dictate , control and rule over the people. I hear a Senator wrote a bold letter to Osama. But don't know his name yet. During WWII the Gestapo relied on snitches too. If these bastards keep it up we will have a Civil War and I know what side I’m on. There will never be enough concentration camps for the 100 million or more Americans that disagree with Obama’s Marxist agenda. No mention of the death of John Hughes. I detest most Hollywood types but John Hughes was a great Chicago icon and produced some awesome films.